I'm so excited to share this review with you. 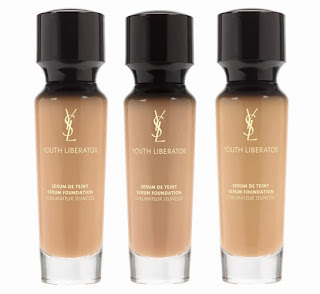 As I mentioned on my previous post, I got YSL Youth Liberator Serum Foundation as a birthday present. My shade is B60. It claims to be infused by anti-aging serum, hence the name, serum foundation. It's said to provide 24-hour hydration and SPF 20 protection. I've put this foundation in test for 2 different days just because I forgot to take 'after' pictures on the first day I tried it on. So here are the before and after I applied the foundation. The foundation instantly evens out my skin tone. It smoothes easily onto my skin and camouflages redness. This definitely offers medium to full coverage, depending on your application. My makeup is just freshly applied here. The foundation looks gorgeous and provides flawless and smooth coverage. The foundation doesn't have a matte finish, although the above picture might show you otherwise. I'd say it has more satiny finish, appearance-wise and velvety finish, texture wise. Does it make sense? What I'm trying to say is once I apply the foundation, I can feel how my skin just feels as soft as a baby's bottom. Now it's time for lasting power test. Fast forward to Saturday. These pictures were taken after about 3 hours of application. Everything still looks great. You can see in the pictures the my skin looks more glowy, thanks to the sunlight and some highlight. I personally prefer this type of foundation rather than matte-finish one for winter because it makes your skin looks healthy and more radiant during colder season, which often makes skin look dull. ●Mally Beauty Volumizing mascara - in love with this! My skin still looks covered. I can still see the blush on cheeks. My eye makeup stays put, which is more because of the eye primer, but still. My skin does get a tad oily especially on my forehead which is the oiliest part of my face, but nothing a little setting powder can't do. I also use Urban Decay All Nighter setting spray to lock the makeup in place, which in my humble opinion plays its role quite minimally. Why? 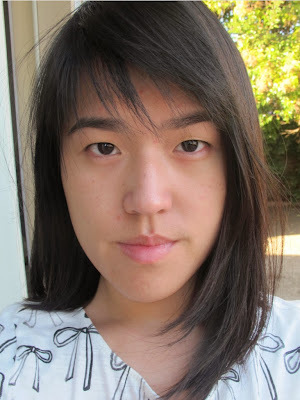 Because I still get much more oily using the setting spray and other foundation that didn't work for my skin, so I don't think it makes a lot of a difference in the 'keeping oil at bay' area. It is a nice addition, but doesn't always work its magic. Anyway, back to the foundation. Overall, I really like this a lot. Even more than the previous foundations I reviewed from Marc Jacobs and Jouer. It provides coverage but still keeps you looking natural and not too made-up. I don't have to layer on the product to get the coverage/look I want. One layer did the job for my skin. I realize $69 is very expensive for a foundation. That's why I was hesitant to get it for myself. But after trying it out for myself and seeing what the product can do, I'd say it's well worth the spend (well, even though I didn't spend the money myself this time, I would repurchase). Foundation is the key of great-looking makeup, so if you want to invest in one product, it's best to be a foundation. You can also go to the YSL counter in the department store (Sephora currently doesn't carry this product), ask for a sample and see it for yourself. I highly recommend this foundation if you're looking for a hydrating, natural-looking foundation. Those two criteria are particularly important during colder weather when skin tends to get dull and dry. Are you interested in giving this a try? What's the best foundation you've tried?